2.) Bohol Island Tour Guides Association of the Philippines (BITDAP), Inc. 3.) Integrated Midwives Association of the Philippines (IMAP), Inc. 4.) Bohol Federation of Senior Citizens Associations of the Philippines (FSCAP), Inc. 6.) 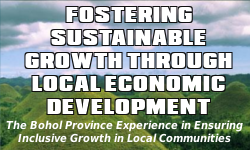 Bohol Integrated Development Foundation (BIDEF), Inc. 7.) Participatory Research, Organization of Communities and Education towards Struggle for Self-Reliance (PROCESS) – Bohol, Inc. 8.) United Families for Transformational Development, Inc. 9.) Federation of People with Disability, Inc. 12.) Bohol Chamber of Commerce and Industry, Inc. 15.) Association of Writers and Radio Announcers Foundation, Inc. 17.) Bohol Paddlers Association, Inc. 19.) Life Philippines Foundation Bohol, Inc. 20.) World Vision Development, Inc. 24.) Soil and Water Conservation Foundation, Inc. 34.) Bohol Sunshine Home Foundation, Inc.